Professional straightening treatment, free of formaldehyde, which straightens your hair quickly and conveniently for 10 weeks. Its formula enriched with keratin, organic argan oil and straightening components, penetrates hair strands, repairing moisturizing and straightening hair, leaving it smooth, soft, shiny and with natural movement. SHAMPOO: Cleans hair, leaving it moisturized. Free of sulfates, parabens, salt and gluten. TREATMENT MASK: Straightening cream for all types of hair. Free of formaldehyde. Argan oil is extracted from the fruit of argan tree. It is rich in vitamin E, carotenes and antioxidants that strengthen hair, making it shinier and more flexible. It moisturizes and protects hair fibers from external aggressors. Formula free of formaldehyde, salt and sulfates. What is Kativa Keratin Xpress Brazilian Straightening? It is a treatment free of formaldehyde, which allows straightening and reducing hair puffiness easily and conveniently, from the comfort of your house. Can I use Kativa Keratin Xpress Brazilian Straightening if I went under other straightening processes before? Can I use Kativa Keratin Xpress Brazilian Straightening on dyed hair? Yes, you can use it on dyed hair. This product may cause variations on hair color. We recommend using it the next time you will dye your hair. Can I use Kativa Keratin Xpress Brazilian Straightening after dyeing my hair? How long does the Kativa Keratin Xpress Brazilian Straightening treatment last? The treatment lasts for up to 10 weeks if the process if conducted correctly, following the indicated steps. 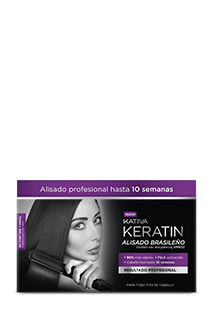 Does steam is produced during the Kativa Keratin Xpress Brazilian Straightening treatment? Yes, steam is produced due to the effect of heat (blow dryer, falt iron) on wet hair; it is moderated steam, it is not toxic or irritating. 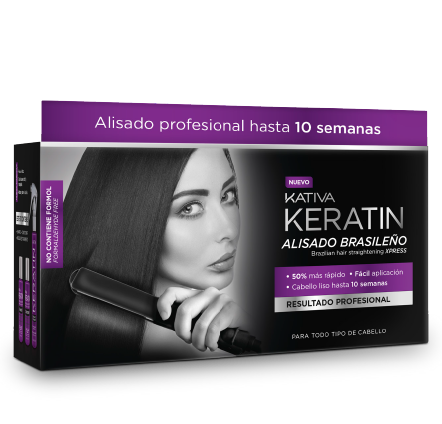 Kativa Keratin Xpress Brazilian Straightening does not include any substance forbidden for cosmetic use in its composition. 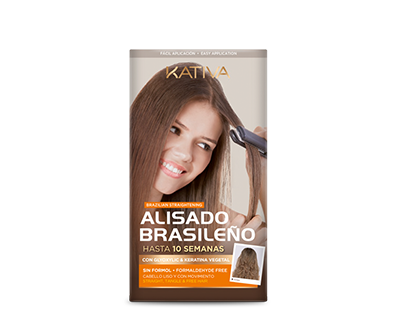 Can I tie my hair, or use hair clips after using the Kativa Keratin Xpress Brazilian Straightening treatment? Is this straightening treatment recommended for wavy and curly hair?